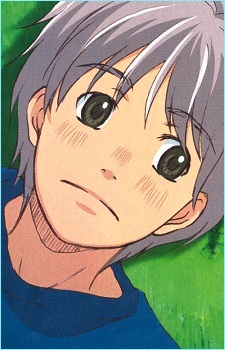 Aged 19 (at the beginning of the series), Yuuta Takemoto is a second-year student at the art college. He is from Annaka city, Gunma-ken. He lives in the same apartment complex as Mayama and Morita in room 202. His floormates are Morita and Hasegawa. Takemoto studies architecture, but has little certainty as to what he wishes to do upon graduating; his decision to attend art college was because he liked to build things with his hands, like he had with his father. Takemoto is one of the more mellow characters in the series. He falls in love with Hagu immediately after being introduced by his professor and keeps his feelings to himself throughout most of the series. His love for Hagu and his inability to act upon his feelings as freely as Morita causes some internal problems for Takemoto. For example, when Hagu received a bird brooch that was made for her as an anonymous present, Takemoto couldn't bring himself to say that Morita was the one who had made it for her. Instead of acting on his feelings, Takemoto decides to be more of a brother figure to Hagu, giving her friendly support when needed. For example, Takemoto accepts Hagu's requests to build her sophisticated dollhouses and the like. Takemoto is very close to her. His relationship with his family also contributes to his mellow mood. His father died when he was still young. Also, his mother works at a hospital as a nurse, so Takemoto would usually spend a lot of his time there, even his Christmas holidays. Furthermore, Takemoto is uncomfortable with his mother's new husband, an outspoken man whose persona seems to a polar opposite to that of his father. However, Takemoto tries to get used to his company and tries to accept the fact that his step-father is capable of looking after his mother, since Takemoto has worried about his mother's well-being ever since he left home. His mother's remarriage and her assurance that he is now free to do as he wishes instead of taking care of her all the time later influenced Takemoto's decision to attend art college. Later in the series, Takemoto has to stay another year due to getting a stomach ulcer and not being able to complete his graduation thesis. During the end of the first season, Takemoto goes on a journey across Japan on a bicycle, meeting several people on the way, including a group in Zuigan-ji in Matsushima which is involved in the renovating of ancient Japanese structures and buildings all around the country (which he wishes to join), finally reaching Cape Sōya in Wakkanai, Hokkaidō. After arriving back to Tokyo, he finally confesses his feelings for Hagu, but she did not have the courage to answer him, thus Takemoto figured his feelings for her were unrequited.